QB: There's enough talent on this team that if they're utilized properly in this system, the starting quarterback can be fantasy relevant. However, I won't waste any time trying to pump up Matt Cassel for Paper Pigskin purposes. Playing in the NFC North, this team will be involved in a lot of shootouts. If the team can stay in playoff contention through the early part of the season, Cassel will keep his job and can be used for spot duty during bye weeks. Rookie Teddy Bridgewater will get a chance to soak up Norv's brilliance and will be thrown to the wolves if the losses pile up, draft him in your dynasty leagues. RB: Adrian Peterson said he is looking forward to playing in the team's new offense because it is more versatile than the one the team had been using for the last several seasons. No one should be surprised if Peterson sets a career high in receptions with Norv Turner, who usually feeds his RBs targets, at the helm of the offense. His two best Paper Pigskin seasons coincided with his two best receiving seasons. Turner is the coordinator to bet on, he’s already said he wants to pass the ball more to Peterson. Everyone is betting on Shady McCoy to finish at the top of the RB pecking order but I place my bet on this guy… All Day! Jerick McKinnon is the pass catching 3rd down back but Matt Asiata is the main handcuff. WR: Greg Jennings is a dependable receiver who will see a ton of balls thrown in his direction. Make no mistake about it, he is the number one wide receiver on this team and along with Kyle Rudolph, will jockey for the team lead in targets. He was a mere pedestrian last season except for games where Matt Cassel was the quarterback. In the six games started by Cassel, Jennings had 34 receptions for 413 yards and three scores. Factor in Turner as the coordinator, and we can forget about a sleeper, we’re looking at a fantasy zombie valued at his WR57 ADP; I’m for sure targeting him earlier than that, somewhere around the 11th round of 12-teamers. Norv has had great success with his number one receivers over the years, however only crumbs trickle down to the other guys. That being said, Cordarrelle Patterson is the guy that everyone expects big things from this season but he is still raw and is limited with his route running. One of the first things Turner did when he joined Mike Zimmer’s staff is design 10 plays specifically to suit Patterson’s talents. They’ll do what they can to get the ball in his hands via hitches and end-around runs; that’s the best bet for him to prosper because he won’t run many deep routes other than the “Go”. He holds high value in leagues that count return yards, but other than that, I’m passing on him with the WR20 ADP. Don’t get me wrong, he will have some explosive top-5 weeks but will also be useless at times; I prefer consistency on my roster. 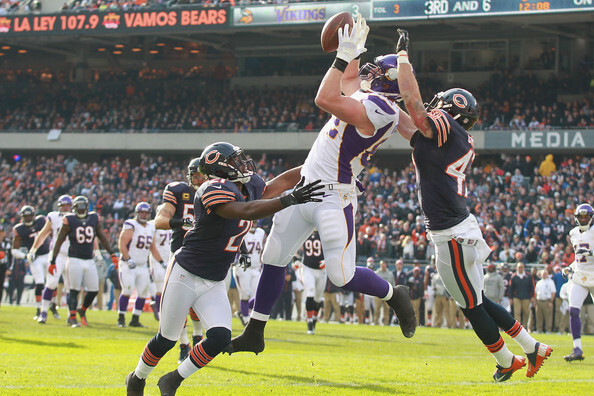 TE: Kyle Rudolph is primed and set up to explode as a breakout player under the Tight End Whisperer Norv Turner. Turner was the OC in Cleveland for Jordan Cameron's 2013 explosion (matter of fact, I called thatbreakout) and has finagled career years out of Jay Novacek, Randy McMichael, and Antonio Gates in the past. Rudolph the Red Zone Reindeer caught 9 touchdowns in 53 receptions in 2012. He's a strong candidate to lead Minnesota in catches, especially after dropping 15 pounds to become more fluid in his routes. He's not in Graham, Gronk, or Orange Julius' range but will be just as good as everyone else; and he's going at TE10. Def: This unit is a risk to own, even though I’m confident Zimmer’s regime will turn things around, they play in the AFC North and have to face explosive offenses six times this season.